For over 2 years, Chef Joanne Chang has been an active, compassionate supporter of Family Reach. She joined our mission after cooking alongside Ming Tsai in the first Cooking Live! Boston event. In 2013, Joanne returned as a featured chef for the 2nd annual Cooking Live! Boston, helping to raise $275,000 for families fighting cancer. Joanne returned as a featured chef for the 2013 and 2014 annual Cooking Live! Boston events, which raised a combined $540,000 for families fighting cancer. Our Boston events wouldn’t be the same without the famous, creative desserts of Joanne! An honors graduate of Harvard College with a degree in Applied Mathematics and Economics, Joanne Chang left a career as a management consultant to become a chef. She is the owner of Flour, an award-winning bakery and café with four locations in Boston. She also opened a Chinese restaurant called Myers+Chang with her husband, Christopher Myers. 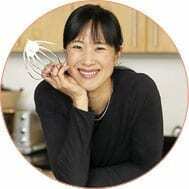 Joanne Chang is the author of the widely acclaimed cookbook, Flour, Spectacular Recipes from Boston’s Flour Bakery and Café, which was followed by the May 2013 release of Flour, Too. Learn more about Flour Bakery and Café.